Fall colors plus charming structures in Vermont and New Hampshire made for two great days of photography. New Hampshire was sunshine filled, while continuous rain marked the following day in Vermont. I had never set foot in either state, so I searched images online for the more picturesque sites. GPS addresses were loaded up in order of visitation for time management. Building and confirming that data took some time, but saved a lot of time when it counted. There were three occasions when GPS took me down a one-lane dirt road with no posted name, nowhere on my paper map, and not the road I had expected to use. Traveling alone, I trusted the electronics to guide me and it always worked. New England roads are poorly identified, and GPS really helped, as I only had those two days to work with. All meals were after sunset-a notable sacrifice for a guy who loves breakfast and lunch! (Crackers and Twinkies at 60MPH don't count, do they?) Very mild HDR editing pulled out shadow detail while maintaining color integrity. Most modern road signs were removed in editing to capture the vintage look these bridges had in days passed. All rights are reserved for these images. This was my toughest photo of the trip. 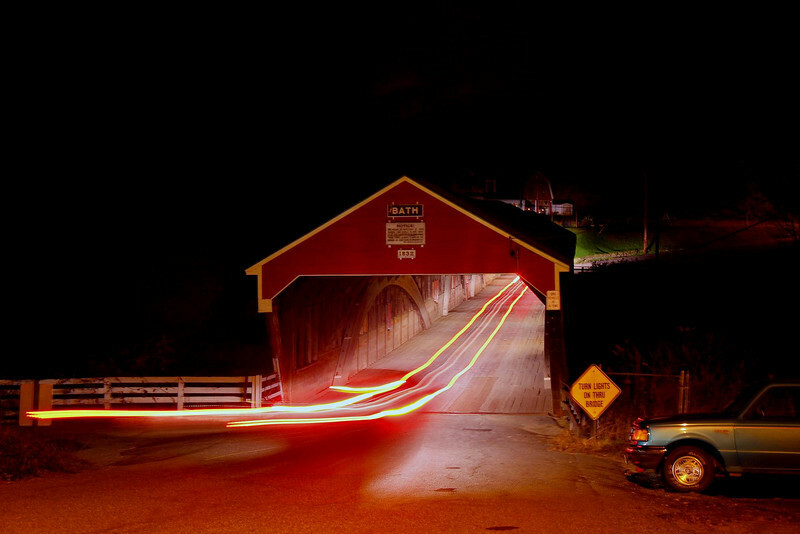 I ran out of daylight before I got to one of my more anticipated stops, the long red bridge in Bath, New Hampshire. Except for the single street light way back behind me, the bridge was in total darkness. I tried a number of time exposures using car headlights to get at least some image of it and this was the most successful one.